Cold mornings call for warm flavours and for the past few weeks I've been toasting a batch of muesli, spiced with cinnamon, nutmeg, whole nuts and chunks of dried fruits, honey and maple syrup. The house always smells amazing when I make it and eating it is such a lovely morning routine. With dark, cold starts, it's a very good reason to leave a warm bed. I WENT TO... Girl Guide camp. Thanks so much for all the love for my post about the five things you can learn from a Girl Guide camp. It's my most read post - ever. I ATE... I have been cooking up a storm at home and, if I do say so myself, there have been some seriously tasty dinners coming out of my humble little kitchen including roast chicken with a cous cous stuffing from the Monday Morning Cooking Club, and that weekly batch of toasted muesli. I've also had good grub out and can recommend both 98 Chairs and Harvest when you're next stopping through Goulburn, and Green Tangerine closer to my Central Coast home, at Long Jetty. The winter lunch specials at Green Tangerine are so good and the granola at Harvest, with winter poached fruits, will have you licking the bowl. I OP SHOPPED... A great 1970s winter coat scored for $5, a trio of vintage coat hangers and a stash of cotton yarn. I MADE... newspaper pots. They were filled with seed raising mix by the grandkidlets on the weekend and I've filled them with echium cuttings and spring flower and vegetable seeds. I READ... I finished the third of what I learned is actually four books from the Neapolitan series by Elena Ferrente. Seriously, a fourth book? I thought there were just three. Gah. I'll have to download it. I also finished Helen Garner's Everywhere I Look and passed it on to my Mum. I keep forgetting to ask her what she thought. Your muesli looks delicious Katie. 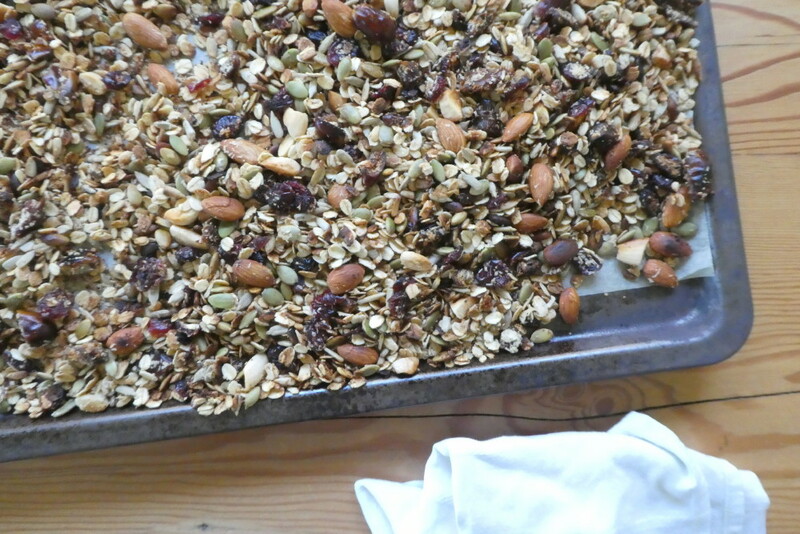 I used to make homemade muesli religiously...well almost! I haven't made it in ages and right now I am back to porridge. Thanks for the reminder. Your other home cooking sounds delicious also.